Since MR. D.I.Y. first outlet opened in Jalan Tunku Abdul Rahman in July 2005, we have been dedicated to make a difference in the lives of our valued customers. Today, MR. D.I.Y. 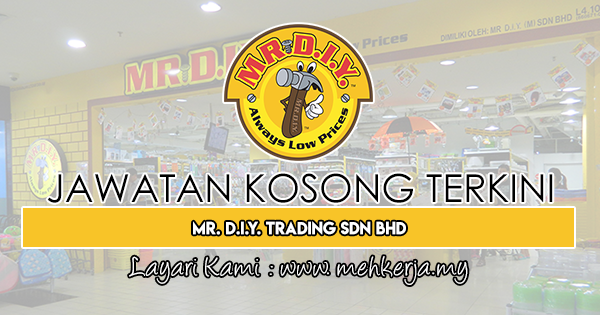 is proudly a home grown enterprise with over 100 outlets throughout Malaysia. Each of our outlets spaces encompasses averagely 10,000 square feet providing a comfortable and wholesome family shopping experience. We employ more than 2500 employees serving more than 45 million customers yearly at all MR. D.I.Y. outlets throughout Malaysia. Kerja Kosong Terkini Mr. D.I.Y. 0 Response to "Jawatan Kosong Terkini di Mr. D.I.Y. Trading Sdn Bhd - 3 May 2019"